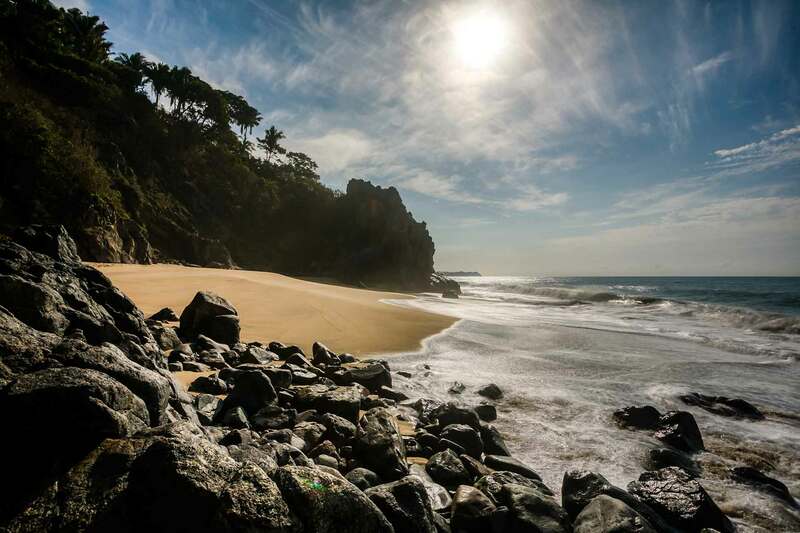 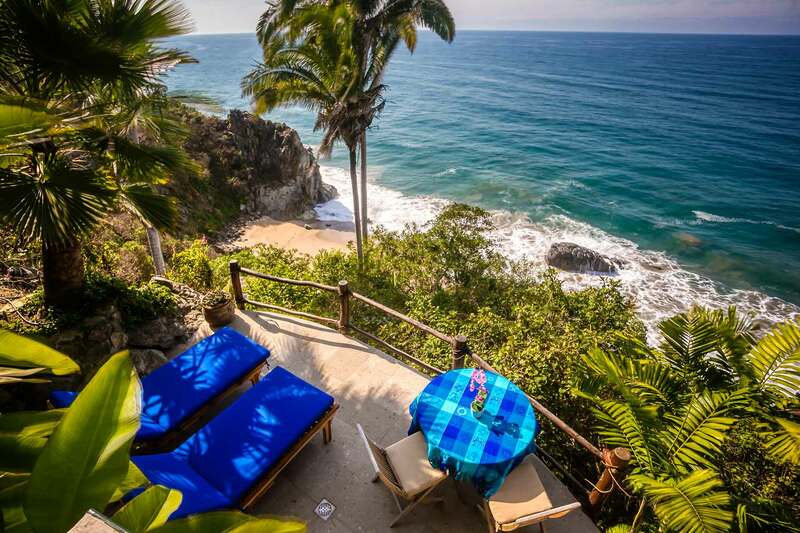 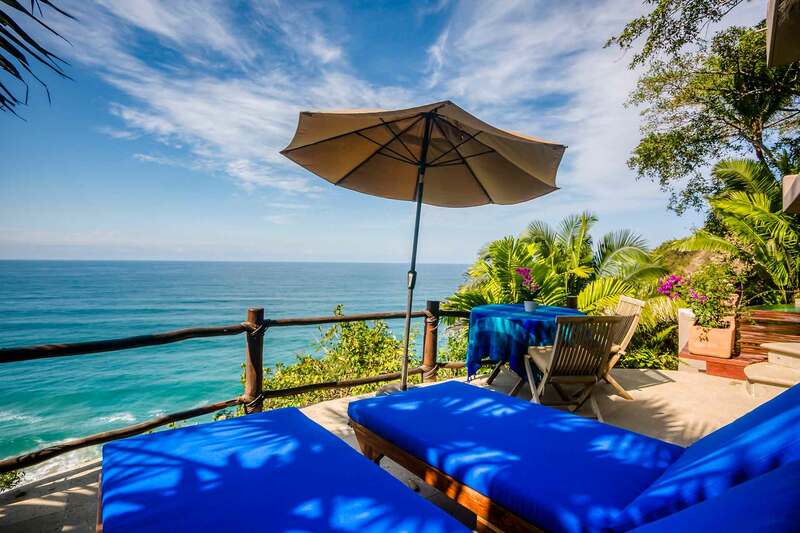 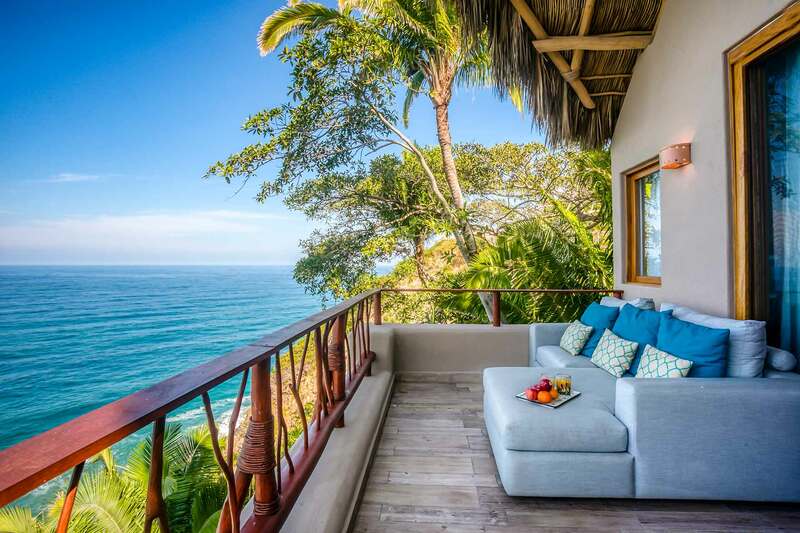 Enjoy spectacular ocean views in total seclusion while listening to the waves of the Pacific Ocean and the jungle birds sing at Casa del Risco. 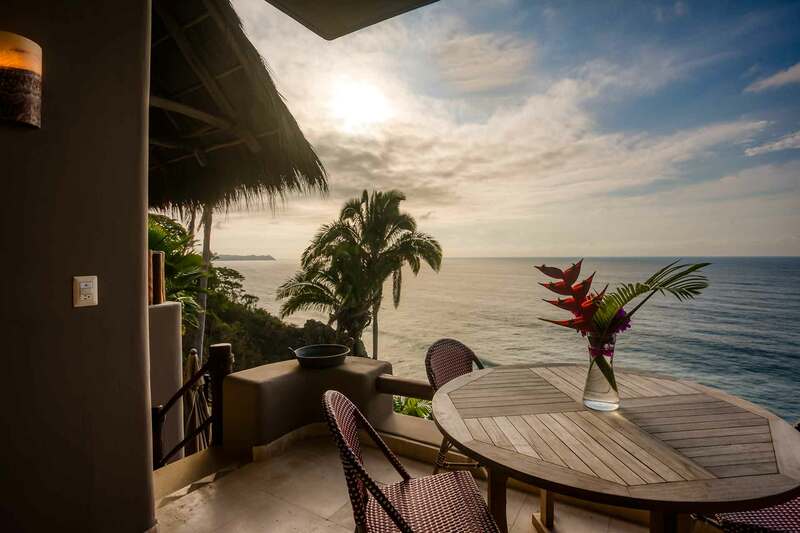 This fabulous home is perched approximately 110 feet above a private beach cove on a private half acre with 180 degree, coastal views of the Pacific Ocean and tropical jungle. 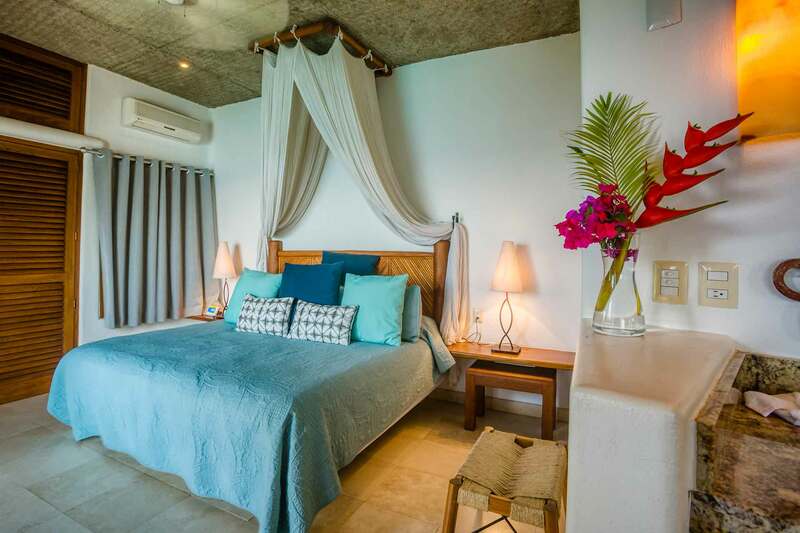 After passing through the iron entrance gate, through flowering gardens and giant palm trees, you will see the second king en-suite bedroom with outdoor shower, ocean view terrace, mini fridge and coffee pot. 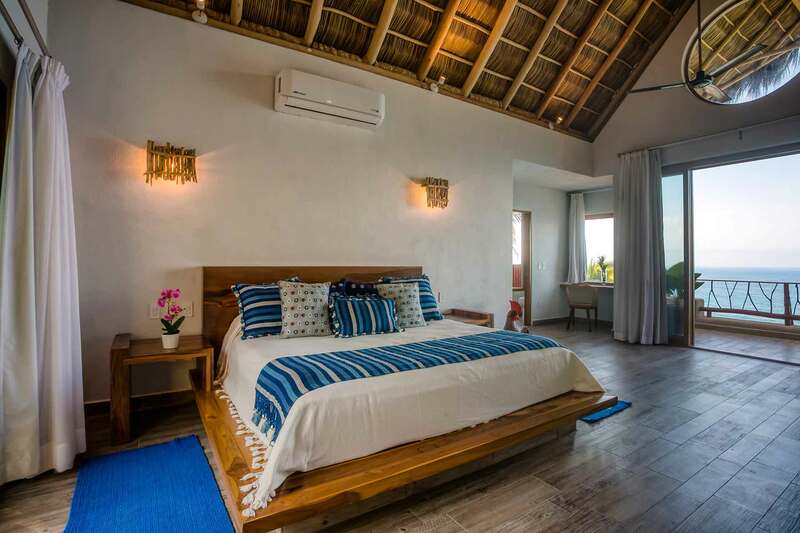 Descend several garden steps over a wooden bridge and through an antique door into the entry level bedroom hosting a king size bed, outdoor shower, kitchenette and terrace. 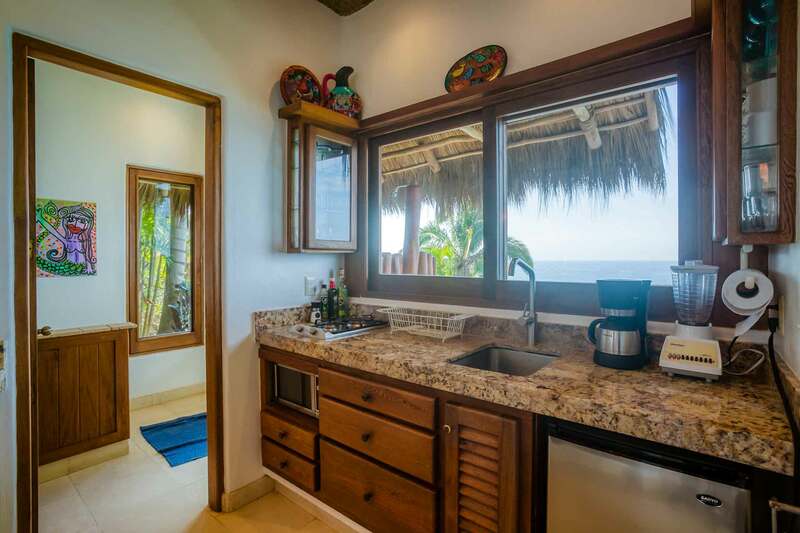 The kitchenette hosts a two-burner stove-top, microwave and mini fridge. 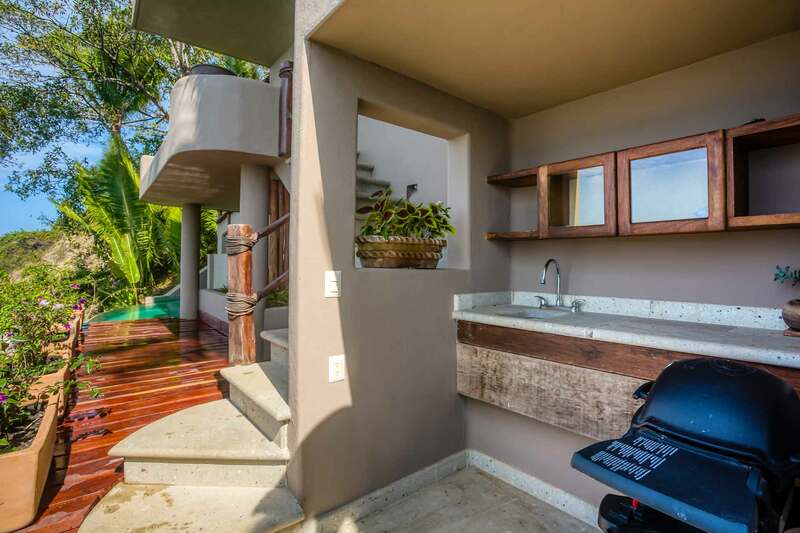 Meander below to another lower level patio with a BBQ, wet bar, two chaise lounges, an umbrella and a dining table for four. 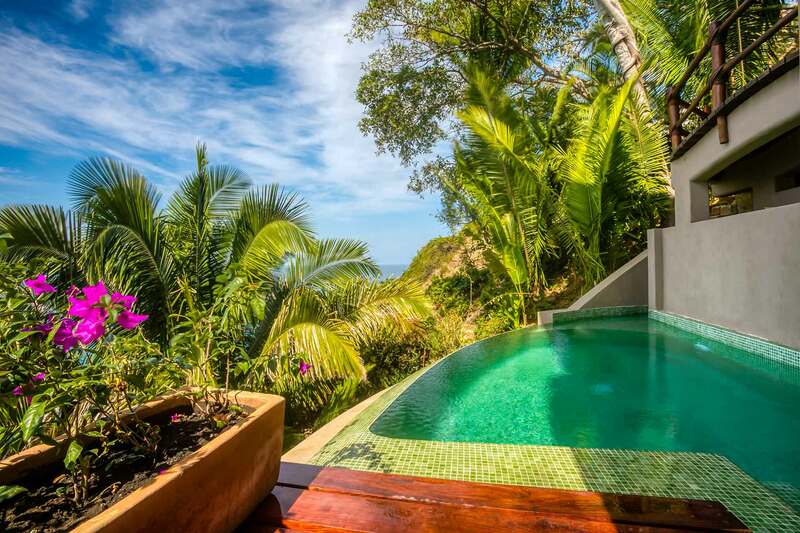 Continuing further out, you will find the ocean view pool. 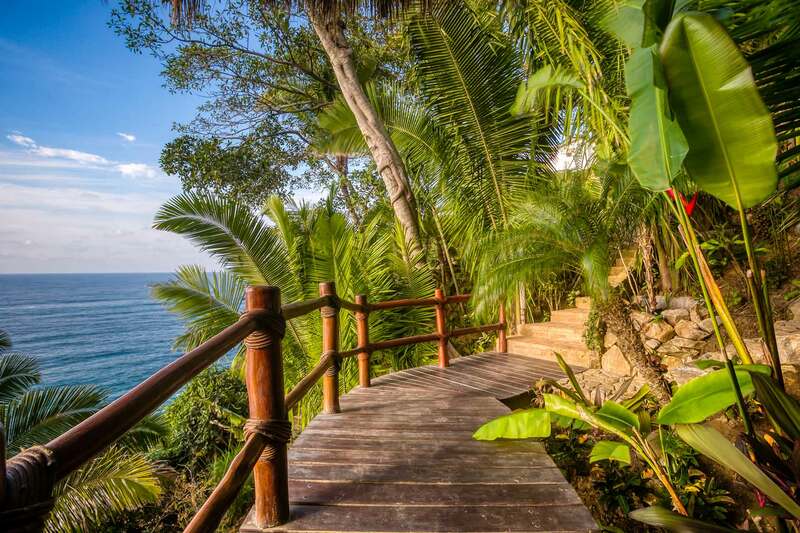 Take the path down a private stairway leading you down the mountain side and to the secluded beach cove below. 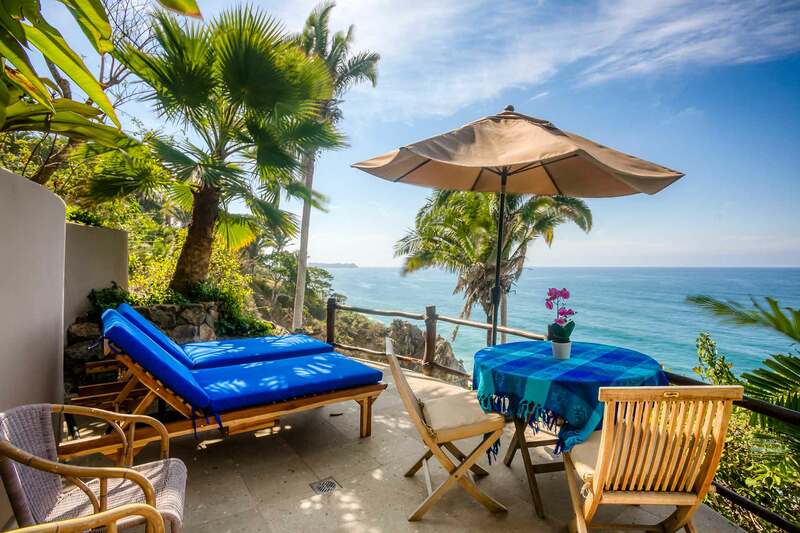 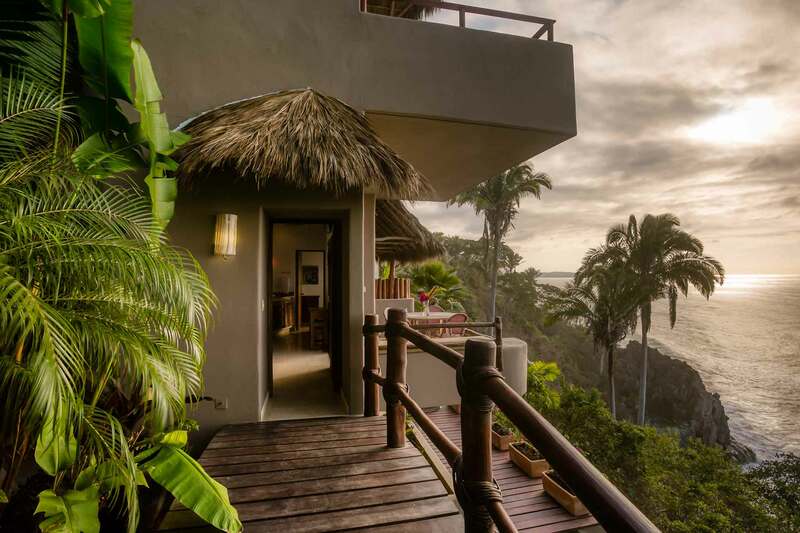 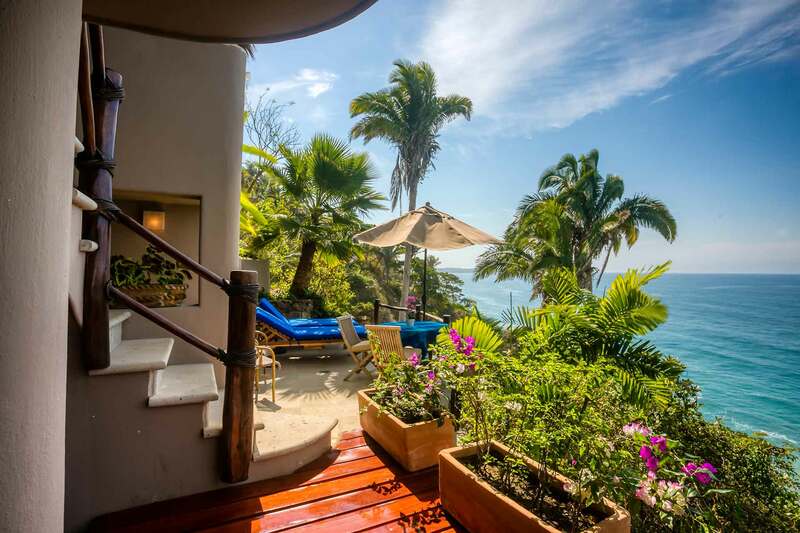 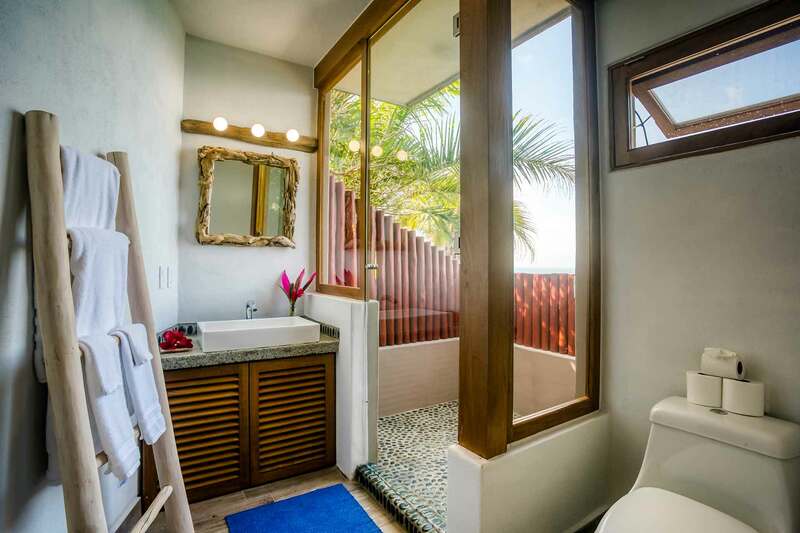 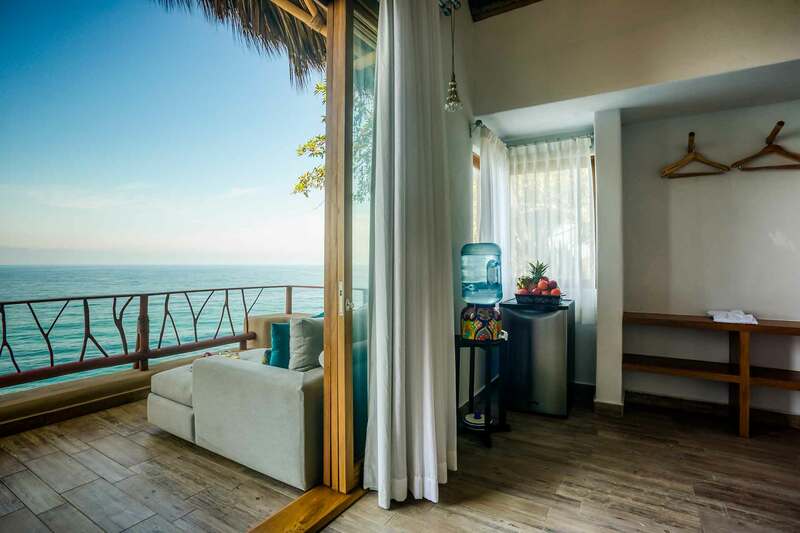 We invite you to enjoy the feeling of total privacy while being in the treetops, overlooking one of San Pancho’s most sought after views of the Pacific Ocean. 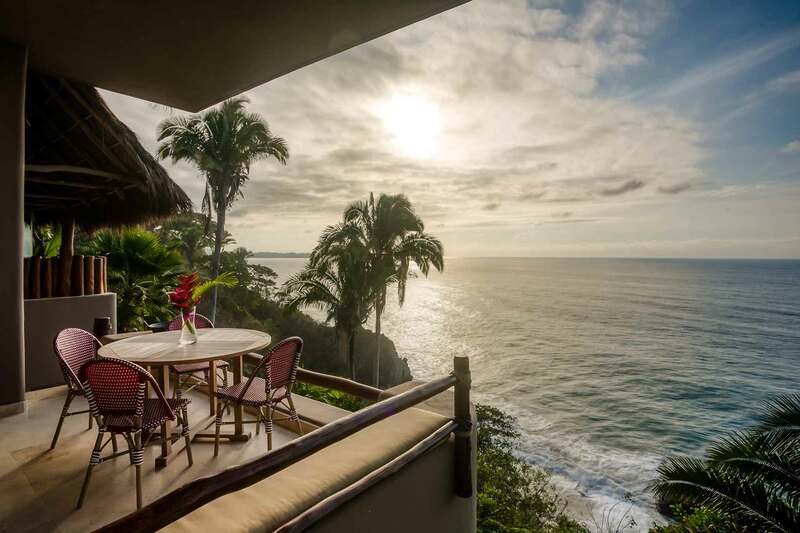 Just a quick drive, takes you to the heart of San Pancho, which offers a variety of restaurants, grocery stores, gift shops and activities for all. 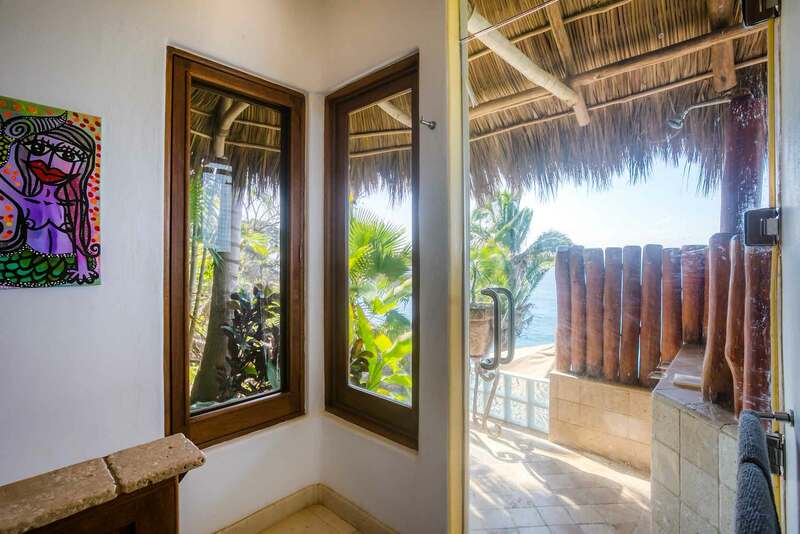 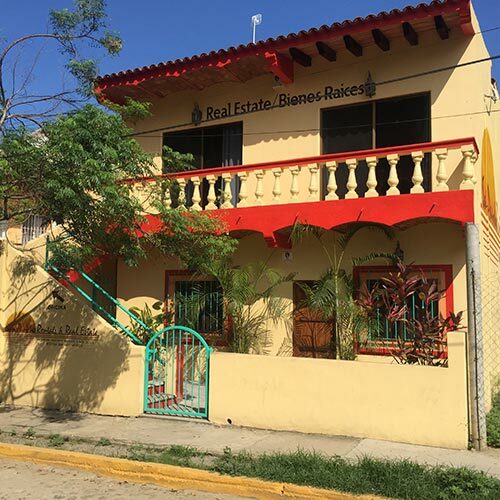 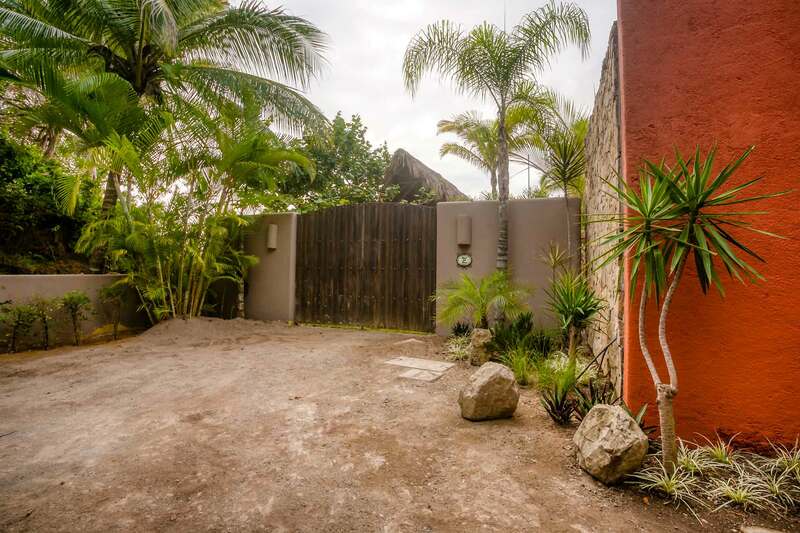 Casa del Risco, a private, detached, two-bedroom/two-bathroom, ocean view home, can be rented with the main house that shares the property or on it’s own. 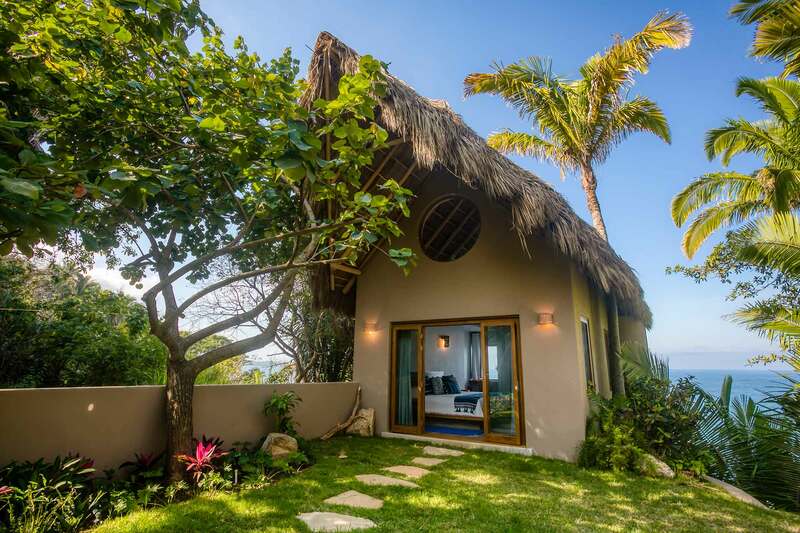 The primary home, Casa Miramar, is a fabulous ocean view villa that hosts three en-suite bedrooms, built separately and secluded from the Casa del Risco. 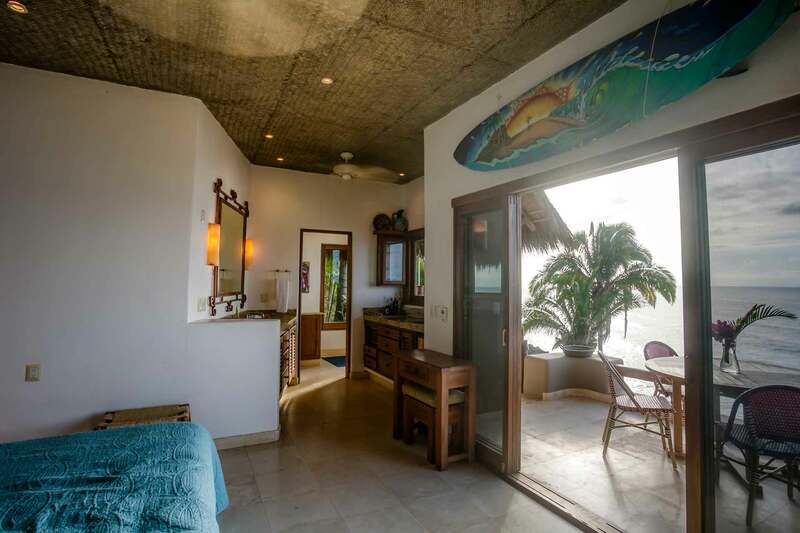 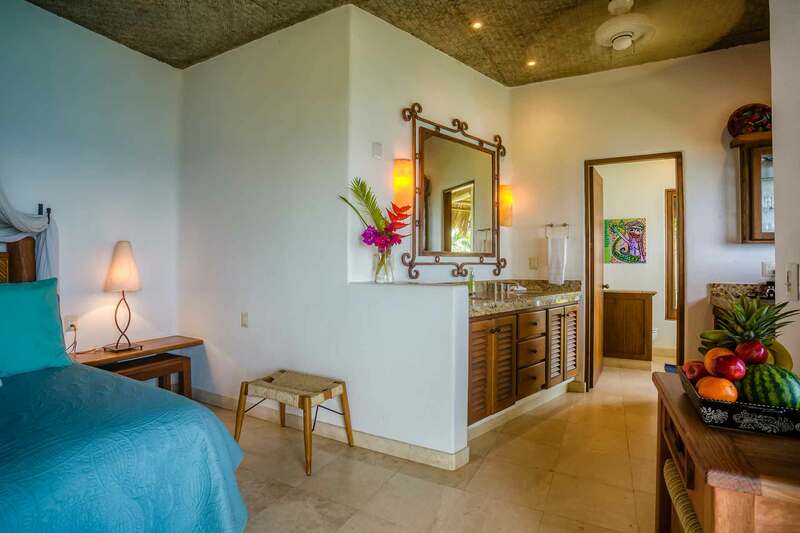 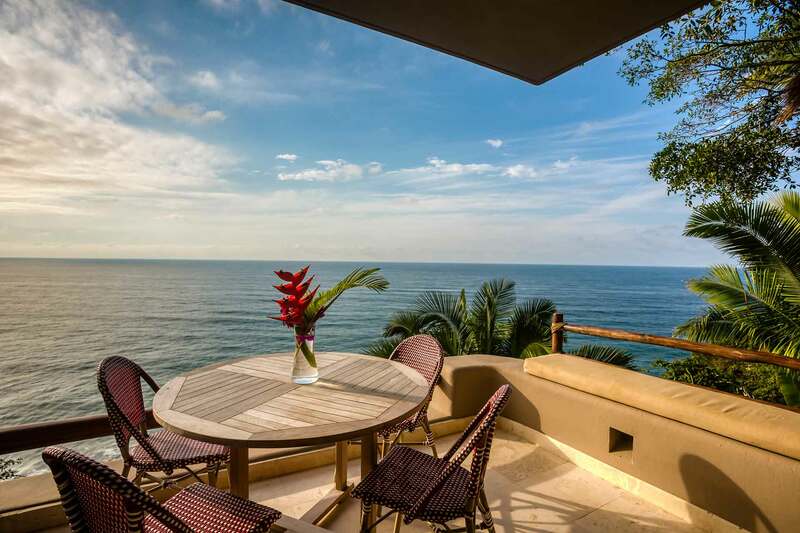 For information on combining Casa Miramar together with the neighboring, two-bedroom ocean view home, please view the five-bedroom option Casa Miramar & Casa del Risco. 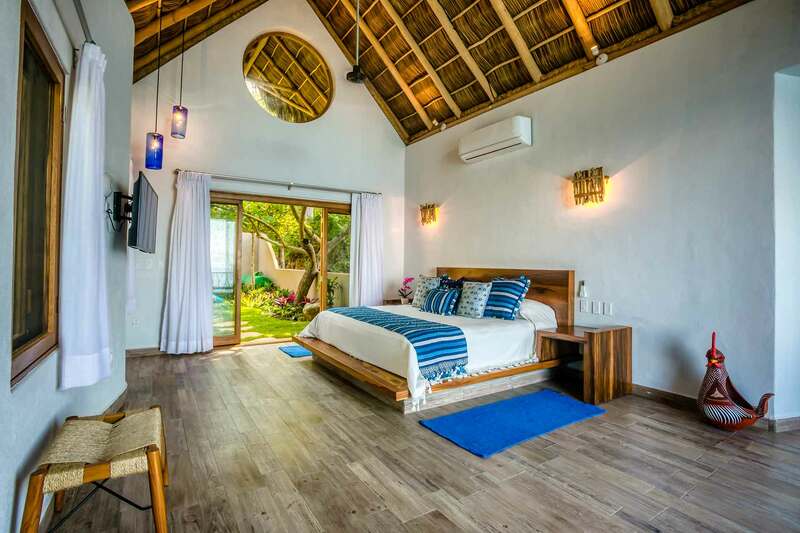 Please keep in mind, if not rented together, the homes can be rented separately and may be occupied by other guests not in your party. 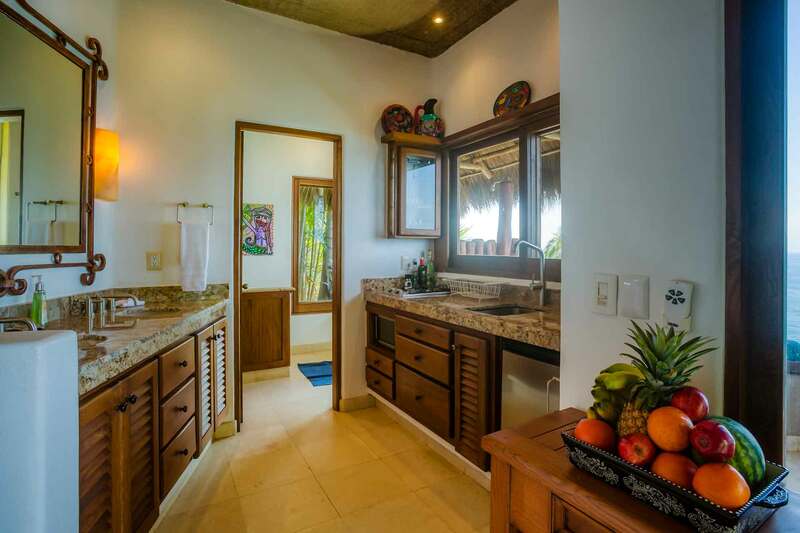  The homes are completely private and autonomous from one another and only share a parking area & beach cove access.